The vast majority of gun owners say that having a gun makes them feel safer. And far more today than in 1999 cite protection – rather than hunting or other activities – as the main reason they own guns. A Pew Research Center survey conducted in February found that nearly half of gun owners (48%) volunteer that the main reason they own a gun is for protection; just 32% say they have a gun primarily for hunting and even fewer cite other reasons, such as target shooting. That’s 22 percentage points higher than 1999 when 26% cited protection as the biggest factor and 49% said they owned a gun mostly for hunting. About a quarter of Americans (24%) say they personally own a gun, rifle or pistol; another 13% say another person in their household has a gun. A large percentage of gun owners (79%) say having a gun makes them feel safer. 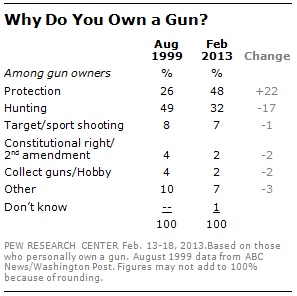 At the same time, nearly as many (78%) say that owning a gun is something they enjoy.